A friend tought me how to make these a while ago and I thought they'd be fun to share. They're super easy and about as inexpensive as it gets. I made these to add to a nursery for a baby girl, but they'd be great decorations for a birthday party in fun bright colors, valentines day in reds and pinks, and I'm pretty sure I've even seen them at weddings. The possibilities are endless. 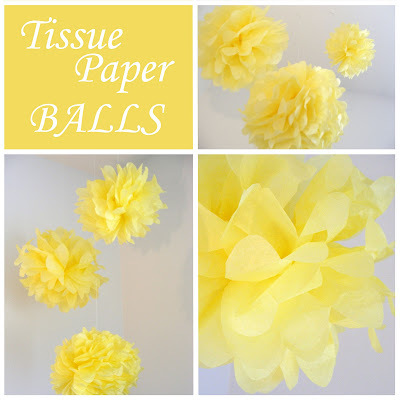 Layer your tissue paper and cut a square. (I think this one is about 12 inches and I used 8 sheets of tissue paper. The more paper you use the tighter your ball will be. Also, you'll need less sheets for smaller sizes and more for bigger ones). and the other end too. Keep alternating sides/ends until all the layers are separated. Fluff, pull, and twist the tissue paper until you like it. Don't be discouraged if the first one takes a minute. You'll find what works best for you and then fly through them! I put a thread around the center of mine and hung them from the ceiling with a thumb tack. You could also use fun ribbon or string. I love Paper PomPoms. They can really dress up a table or backdrop for a cake/candy bar display. Really cute! I've been thinking about making some of these for my daughter's birthday but wasn't sure how to go about doing it. Thanks!